The tower, nave, chancel and north chapel are C13 in origin and so, probably, is the eastern part of the north aisle. All were remodelled in the C14, when the north aisle was was extended to the west end. 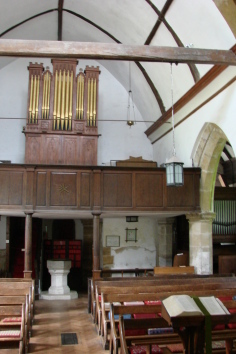 There were further alterations in the C15 and the porch is C18. 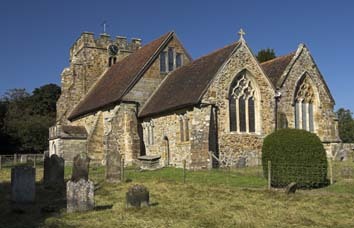 Brightling is exceptional in the inland parts of Sussex in having a church that is mentioned in Domesday Book (9,31). It follows from this that the present dedication cannot be the original and Meads suggests this may have been to St Nicholas, which was later that of the north chapel. Though well inland, its situation on high ground would have made it less wooded and thus attractive to early settlers (Brandon p70). Nothing now obviously predates the C13, though the rubble-masonry of the south wall near its western end could be C11 or C12 as, possibly, the groundplan of the nave could. Blocked north and south lancets show the tower is C13 and though most detail of the nave and chancel is later, the round-headed south doorway suggests early C13 work, perhaps re-using the older walls. 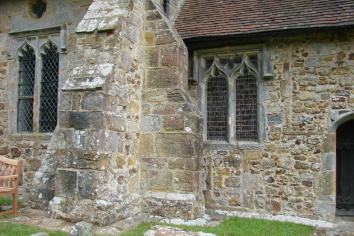 At the south west corner of the chancel there are the jambs of a probably C13 doorway under the present, later window and immediately to the east is that of a lancet, whilst blocked ones either side of the C14 east window show its dimensions were unaltered after the C13. 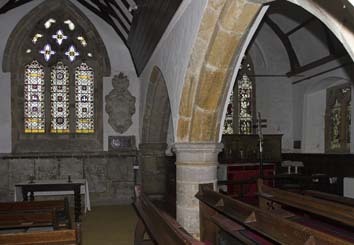 The north chapel is again C13, with a complete north lancet and a low two-bay arcade to the chancel, which, though C13, is later than the nave. Its round pier has an octagonal abacus and the responds differ – the east one is semi-circular and the west one has a foliage corbel. All roof-timbers are old, but obscured by plaster; that in the nave is of wagon form and is probably C14. The north side contains a visually intriguing succession of arches and thus presents some problems. 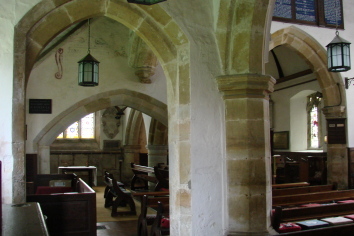 Chapel and aisle are of similar width and the aisle was built in two stages, as shown by the difference in the masonry of its north wall, which is divided by quoins. Inside, the arcade comprises a single arch, east of two that belong together. The arch from the chapel into the aisle is broad and low, and the eastern arcade arch terminates on a corbel above its apex. Also visible above the arch from the chapel is the line of a sloping roof. Godfrey suggests (3 p146) the western part was built first, probably because it has a plain lancet. However, this is isolated and may be re-used. The north chapel is definitely C13 and more likely the eastern part of the aisle was linked with it, possibly as a transept-chapel, though a lean-to roof would be unusual. The two-light square-headed window with cinquefoiled lights is later than that in the western part, which has pierced spandrels. Like the single west light, which has a slight ogee in the head, it shows that the western part of the aisle at least in its present form is C14. The two western arches of the north arcade are of this date, with an octagonal pier and equivalent responds. Also in the C14, diagonal buttresses were added to the squat tower and the upper stage may have been added or rebuilt with battlements and plain double bell-openings, together with a double-hollow-chamfered west doorway with curling stops that are typical of the period and a two-light square-headed window. Of this date too are the tower and chancel arches, which resemble the arcades, though the former is now largely concealed. Most windows were replaced with square-headed ones and there is an area of more regular coursed masonry above the south east window of the nave which suggests the wall might have been rebuilt then, together perhaps only in part with the buttressing beneath. 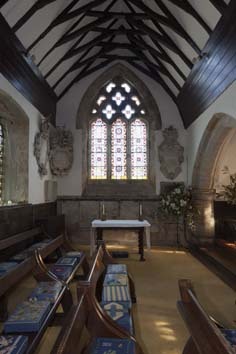 Those in the chancel have pierced spandrels, with an east window of reticulated tracery (the mullions are renewed) and its south doorway has shields in the spandrels. The similar east window of the north chapel has a string-course beneath. Differences in detail suggest the north window of the chapel is C15, the only work of this date. The dates of most C17 and C18 changes are speculative, but the stone south porch is dated 1749 in a quatrefoil. The similarity of this work to that of the previous year at St Michael, Lewes leads Nicholas Antram to suggest (BE(E) p142) that J Daw of Lewes, who is known to have worked at Brightling Park, was responsible. It combines rusticated quoins and a pointed arch and battlements. The heavy buttresses of the south wall may have been altered at the same time – in the Sharpe Collection drawing (1804) they are as today. This also shows the three openings in the east gable, which do not look mediaeval. The quatrefoils over the south nave windows look C18, though their purpose is unclear. The interior was never scraped and the west gallery, with a panelled and inlaid front and standing on posts, and other fittings remain (see below). The C19 changed little, though like the windows, the tower was patched. Dates, beyond a reference in 1885 to a then recent reseating (ESDBB), and names are lacking. The floors and north windows were repaired in 1903 at a cost of £400 (CDG 120 p145) and in 1908 an attempt to widen the south doorway revealed the original one under the plaster. Its head was distorted, possibly a sign of the structural problems that led to the buttressing of the south side, so it was rebuilt, along with most of the porch (see 2). According to the church guide there were further repairs in 1966 by W E Godfrey. Barrel Organ: (West gallery). 1810 (Mosse (ed) p31) and a rare survival, particularly as it is still in working order. In the early C19 it was the most usual alternative to a wind band for accompanying services. 1. (West end) Civilian and wife, c1490, possibly John Batys (ibid p33) now without their children. At the corners of the slab are the symbols of the Evangelists, of which two remain. According to a second inscription, the brass was removed from the church and put back at some date in the early C17 before 1635. 2. (South chancel) Thomas Pye (d1592) Young son of the rector (ibid p30), who kneels with inscriptions in English and Latin, two emanating from his mouth and others above and below the effigy. Font: Plain octagonal bowl, probably C15. 1. (North chapel) C14 fragments, moved from the south east chancel window in 1900 (1 p180). The finest piece shows a delicately drawn female head. 2. (Same) C17 or C18 heraldic glass, which was also placed here in 1900 (ibid p185). 1. (Churchyard) ‘Mad Jack’ Fuller (d1833) Large stone pyramid, said to be by R Smirke (Horsfield I p567). It was built as early as 1810 (WSRO Ep II/27/128) and according to local legend, Fuller was buried seated, holding a bottle of claret; however, when the monument was opened in 1982 during renovations, it proved to be empty (NFSHCT Newsletter 2013 p8). Fuller was the squire and built several follies nearby, but he was more than merely an eccentric; among other things, he was an early patron of Turner. 2. (South nave) Further memorial to Fuller with a fine bust by Sir F Chantrey of 1819 (Roscoe p236), with an inscription etc by H Rouw (ibid p1070). The bust is placed in a rounded niche above this with no obvious connection and Fuller himself may have decided to combine the two parts, as he ordered them separately and the work was carried out in 1819-20; possibly Rouw combined them (M Baker p121). 3. (North nave) William Shield (d1829) Portrait in profile beneath a garland, by P Rouw (ibid p1071). He composed the once popular English opera Rosina. The rather extravagantly worded inscription is said to have been written by Fuller (Mee p56) who was a friend and commissioned the monument. Shield is buried in the cloisters of Westminster Abbey, but the memorial was rejected on account of the inscription, so it was erected here. 4. (Attached to north chancel arch pier) Dr Primrose Blair (d1819). It consists mainly of a large urn on which are intertwined serpents. It is attributed to J Flaxman by Gunnis (p94), though disregarded by Roscoe. 5. (In churchyard to north west of tower) Elizabeth Halloway (d1810) with terra cotta plaque by J Harmer. 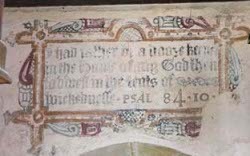 Paintings: (Walls of nave and north aisle) C17 Biblical texts, set in decorative frames, one of which in particular is well preserved. Particularly in the north chapel, some earlier fragments, probably C14 and C15, have been identified. Reredos: (Placed above chancel arch) C18 with painted texts of the Creed and Ten Commandments. It has a curving broken pediment with an urn. Stoup: (By south doorway) Plain and probably C14. My thanks to Nick Wiseman for all the photos marked with NW.